Hi to all my old and new friends! 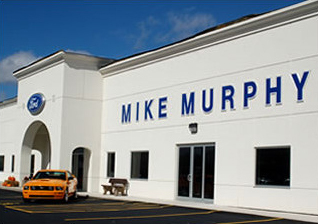 On behalf of everyone at Mike Murphy Ford, I would like to thank you for visiting our web site. We are committed to serving our friends and customers via the Internet and look forward to hearing from you. We are a full service Ford dealership offering first class sales and service for our valued customers. We have been in business for over 34 years since August 1984 at 565 West Jackson Street in the heart of Morton, Illinois. Our phone number is (800) 579-4670. If you have any questions or need to reach me, you can call the dealership’s phone number or email me at mikemurphy@mikemurphyford.com. 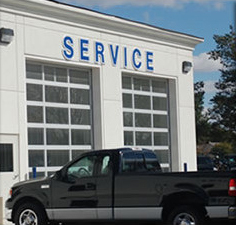 Mike Murphy Ford has been serving the Morton community and our customers for over 34 years! We pride ourselves in making sure that every person walking into our dealership is treated with courtesy and respect. And it is only with feedback from our customers that Mike Murphy Ford knows we are doing things right. We are pleased to announce Mike Murphy Ford is the proud recipient of the prestigious Ford President’s Award again for 2017. This marks 19 out of the last 21 years that we have achieved this exclusive award. 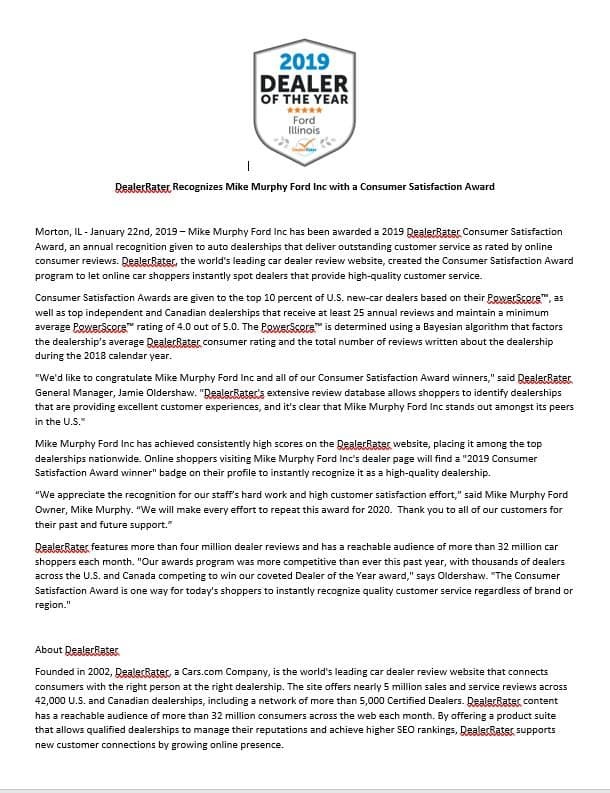 The President’s Award acknowledges Ford Dealerships that have led the nation in exceptional service and vehicle ownership experiences for their customers. Ford Motor Company’s President’s Award is earned by an exclusive group of approximately 400 out of nearly 5,000 dealerships. This honor is awarded annually to dealers who provide their customers with exceptional treatment throughout the life of their Ford vehicle. Mike Murphy Ford works hard at fostering a customer first culture with all of our employees. We work hard to earn your business, and our work doesn’t stop after you purchase a vehicle from us. The real work starts after the sale. Our award-winning staff is dedicated to ensuring your complete satisfaction, whether it be with our sales team, service department or parts department. We will always strive to improve.